In the previous lesson, we set up our first application's project. We will now be creating another activity and sending a message by using buttons, which will determine which song will be played. Let's have another look at our app's architecture. We have a MainActivity with four icons, each of which is a button. When we click any button, we keep track of which button is pressed, and we start the SecondActivity by sending a small message. To start other activities, Android requires the usage of Intents. Intents are messages that hold data about a desired action. We pass in an Intent, for example, when we start a new Activity. We can even bundle extra information along within our Intent, which can be used in another Activity. This will become more clear when you see it in action. Let's start by creating our SecondActivity. 1. 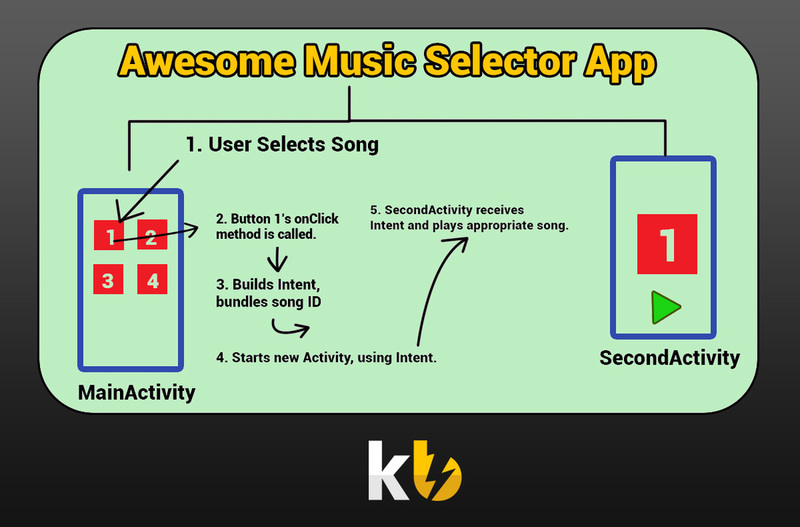 Right click on your package: mine is called "com.example.awesomemusicselectorapp." 3. We will also make this a Blank Activity. Call it SecondActivity. IMPORTANT: Eclipse should have automatically defined the SecondActivity in your manifest. If this is not done, then your app will crash when you attempt to open the SecondActivity. Make sure that your AndroidManifest has any activity that you open. This should make the two activities landscape. Now when we run our app, it should be in landscape mode! What's the point of having two activities if you can't start the second one? Let's create a button that will take us to the second activity. There are three ways you can modify the UI of your app. The first (and possibly the easiest) is to use a Graphical Layout, which will show us our XML files in a realistic preview. 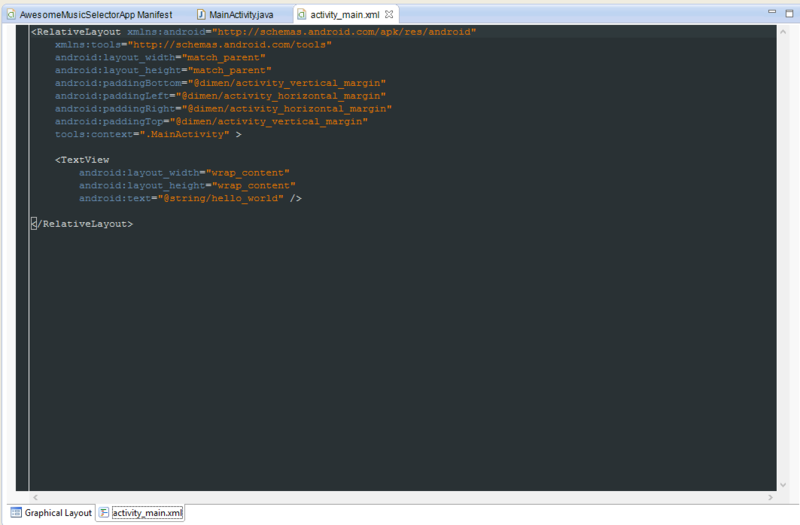 The second is to use XML to insert objects and to modify them. The third is to do it dynamically in Java. We will be sticking with the first two for this lesson. res > layout > activity_main.xml. Again, these are two ways to modify the same file. 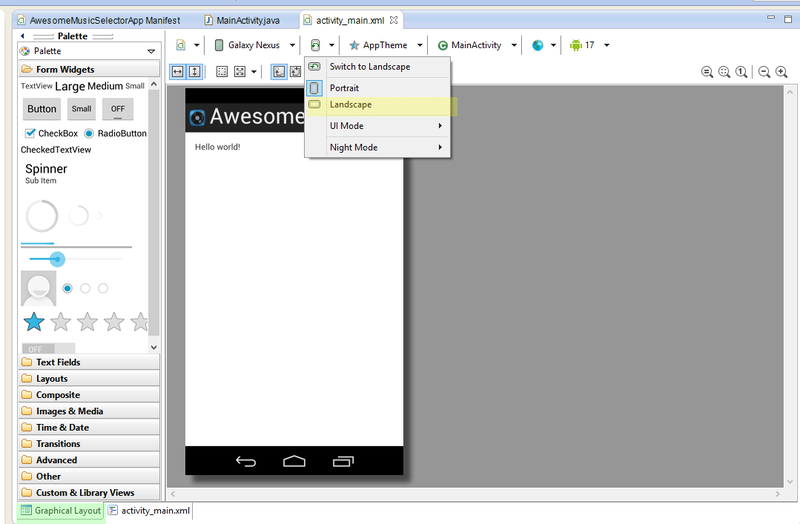 Make sure that you change the preview in Graphical Layout to landscape (it does not take the Manifest into account). Let's begin by removing the existing TextView and adding four buttons in the Graphical Layout. To do so, we click on "Hello world" and press Delete, and then we select the button widget from the left and drag it to a desired location (four times). Yours should look something like this. Try adjusting the margins (alignments) to make everything equidistant! I made everything 19dp and 38dp apart, because I plan on making these buttons into squares. Note: If you copy my XML below, your GraphicalLayout should be identical to mine (given that you have the same screen preview options). If you run the app at this time, you will notice that your buttons do nothing. Zero. There are many ways to make them do something. We can do something in XML, or we can do it in Java. Let's add a button listener in our MainActivity.java. 2. Import "Button" by pressing Ctrl + Shift + O. 3. 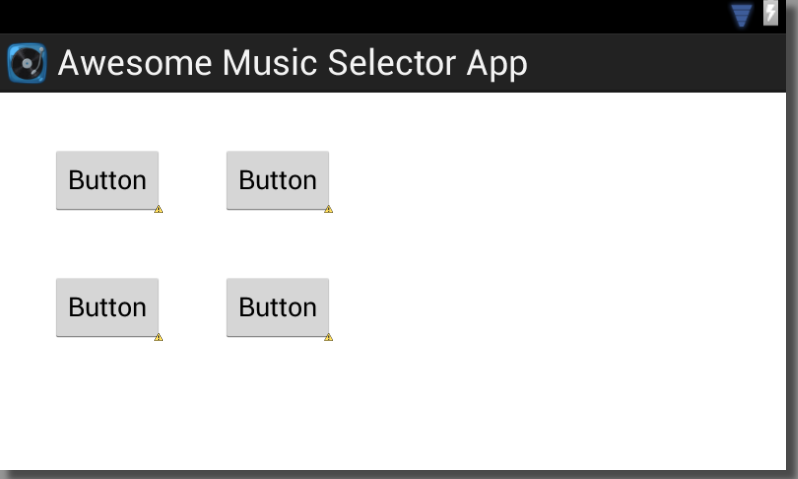 We will now initialize each of these buttons in the onCreate method. To do so, we retrieve each button by its ID. 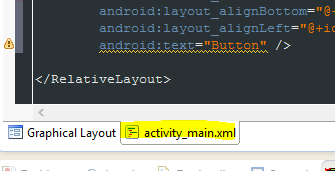 Buttons b1, b2, b3, b4 should have ID's button1, button2, button3, and button4 (as defined in our activity_main.xml). 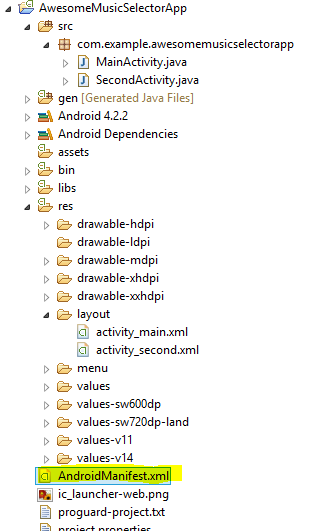 Notice that findViewById retrieves a View (a basic element in Android). We then cast it as a Button by using (Button), which takes the View and turns it into a Button object. 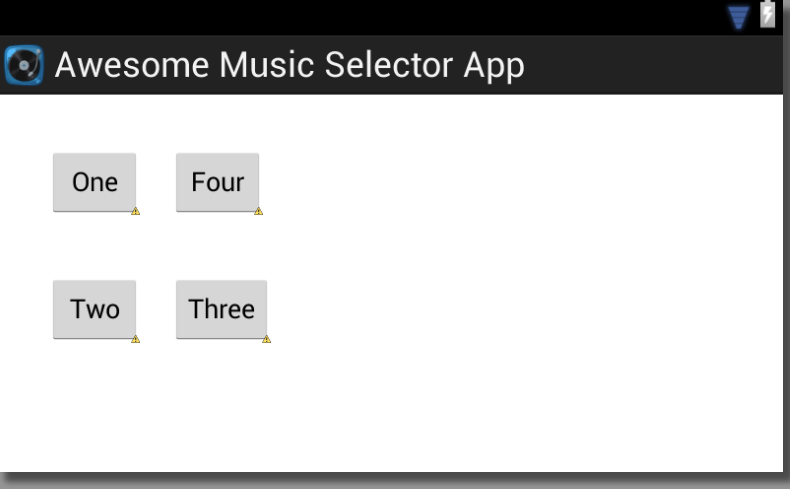 This now allows us to refer to the four buttons: b1, b2, b3, and b4. Make sure you call createListeners() inside your onCreate! Otherwise, it will never be called and your buttons will NOT work. Also make sure that you import properly! Check my imports if you have errors with undefined objects. Inside the empty onClick method for each button found in the createListeners method, we can tell a button to do whatever we want. I will create another helper method, in which I will create an Intent, which I will use to start my secondActivity. This method is straightforward. Notice that it will take in an integer as a parameter. In the first line, we create an Intent that will take this Activity (MainActivity) to the SecondActivity. Then, we add the value of the passed in integer (buttonNum) to the Intent, along with a key of "BUTTON NUMBER" so that we can keep track of what this message means. We finally call startActivity by passing in this newly created intent. This will start our SecondActivity (no matter which button is pressed) and also send a message that can be retrieved on the other side (an integer between 1 and 4 -- discussed in the next lesson)! Refer to our app's architecture one more time. Everything is coming together now! We will discuss step 5 in detail in the next lesson. Thank you for reading, and see you in Day 5! Please Like us on Facebook if you are enjoying the tutorials!